I need to repair sash windows and I am also interested in keeping my home warm, what’s the best option? Home » Sash Window Advice • Sash Window Repair » I need to repair sash windows and I am also interested in keeping my home warm, what’s the best option? Sash window repair, more often than not, is an economical way of handling your restoration in your home, but when does a sash window become past it’s use by date? London Sash Window Repairs Ltd will repair any sash window and there is no quibbling this, if you want to repair, we will. To date, we have never replaced a sash window that client would like to repair, but there have been cases we have repaired windows to the point replacement would of cost a similar amount of money. This situation normally occurs when listed properties have two options, make good on what they have, or go through lengthy planning battles, just to replace like for like and it’s getting easier to replace sash windows like for like now in listed properties, but there was a period you couldn’t paint, or repair sash windows, without fear of council involvement. Sadly if your a listed property owner, you may still feel this is the case, but we still recommend repair and making use of your windows in almost all cases anyway. So from your sash windows perspective, not a lot lost! This means to most homes, even conversation areas, there is a point at which sash window repair loses merit and replacement becomes more viable. 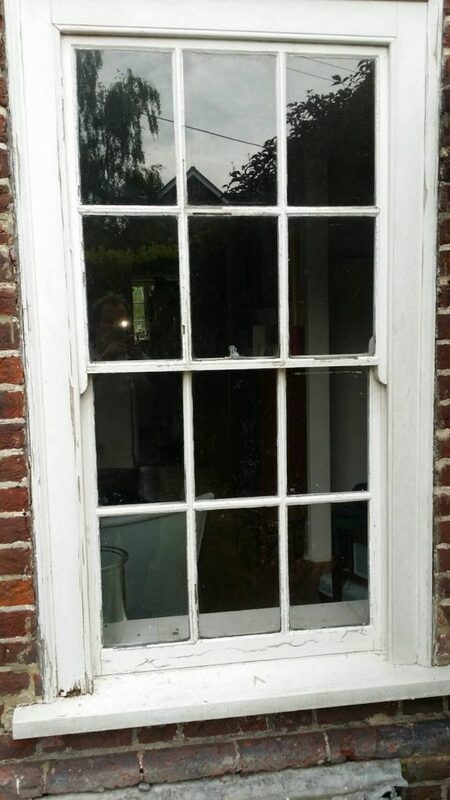 Not least of all, a replaced window is significantly uprated as compared to an original sash window. The draught proofing insulation and double glazed units are significant improvements, and therefore in this article I intend to discuss the benefits of sash window repair, where it’s efficient, and when you might consider replacement. I should warn you before going through a length read, we are very much in favour of sash window repair and therefore the point at which we would advocate replacement, a window might be considerably more perished than another company would suggest replacement, which is why this makes for such an interesting article as there really is no exact right or wrong answer. If you were looking for an article to remove some of the guilt of replacing your beautiful old windows, I am sorry to say this is not it! 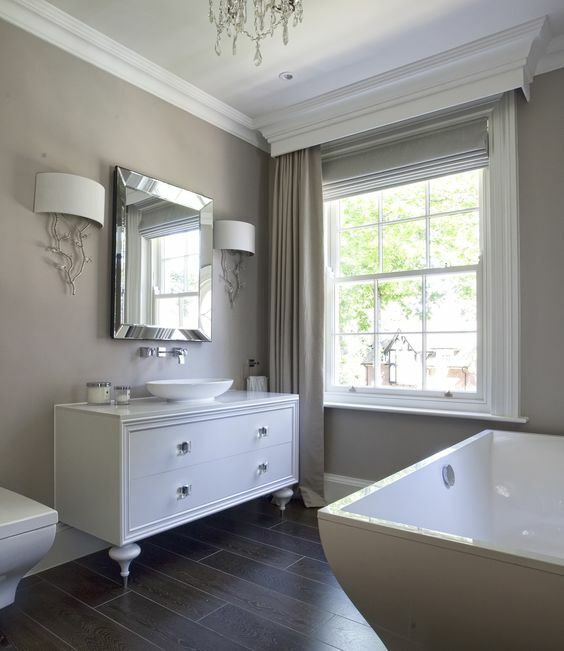 It also shows that finding the right London sash window company is also equally important. You could argue finding the right sash window company is as important as the way you decide to handle you repair sash windows or replace. Customer wishes to improve thermal and noise efficiency of rotten bay window and is considering sash window double glazing. I need to repair sash windows and my house is cold and draughty. Should I replace my windows? My original sash windows are in excellent condition but I want double glazing to reduce noise pollution and improve security. What are my best options? Pictured : repair sash windows bay needed. As you can see in the image, this bay window really needs quite considerable work to get it up to scratch. The lower sash requires splice, and the sills require replacement. The front cheeks need a little work as well, and of course the window will require decoration on completion of repairs. This window has no glazing bar and is a very straight forward installation. The complete replacement cost in this example using our service would be £4500.00 for high quality double glazed sash windows made in softwood, with a hardwood sill – this is a great example because it’s as cheap as a sash window replacement will ever be therefore, you can workout the value of extensive sash window repair versus the cheapest replacement double glazed sash windows. Aside from replacement we have three other options. Sash window repair and draught proofing is one of them. Replacing the sills in this example and effecting repairs to the sash will cost £420.00 in softwood for the sills, and £540.00 in hardwood. I’d highly recommend the hardwood option – you can see just how much weathering these sills are taking. The sash splices and the front cheeks will cost a further £300. The draught proofing and servicing of these three sash windows will cost £600 – two hundred pounds per window. This gives us a grand total of £1440.00. We must however consider that decoration of this bay window is required. You may well like to decorate yourself and make the saving of £650, however for the example I wish to include the price to provide an accurate, unbiased guide. 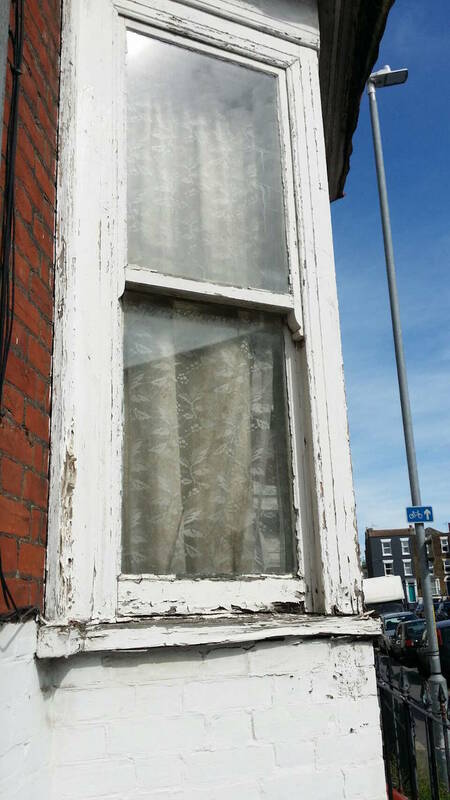 Total cost, including decoration and sash window furniture would be £2100.00 to refurbish this bay window. As you can see this window is in really poor condition. This should make it quite obvious that London Sash Window Repairs Ltd is geared up for sash window repair and draught proofing. It is quite possible you can find a cheaper price for replacement, but not by much, and you’ll certainly find more expensive for the same high quality we produce as well. A price tag of £6000 for this bay window wouldn’t be that surprising. It might be listening to the prices without receiving any quotes yet, but brand new double glazed sash windows are an expensive product, not the markup, they are simply expensive to make and require very skilled tradesman to make. The next option would be to repair, draught proof, and double glaze the original sash windows. All of the costs for draught proofing and repair stand as was so £2100.00. The cost of rebating the original sash windows, and then installing double glazed units to the existing sash windows would be £400 per window and it’s a bay of three sash windows. This would mean double glazing would be in total an additional £1200.00 for this bay window. So to double glaze this original bay would be £3300.00. There is a saving of £1200.00 to be had but then there’s more to consider. Not only is the original not going to be as aesthetically pleasing as a new sash bay window, the double glazing of the original sashes will be limited to an 8mm air cavity within the sealed unit. The brand new double glazed sash window will have a 16mm air gap which is considerably more efficient at noise reduction and will help a little extra with heat retention, but not considerably. So at this point £1200.00 does not represent a great saving at all. However it get’s a little more complicated, or as I prefer to look at it, you have more options here. If you are a keen home improver, a bay window like this is certainly very paintable for anyone with plenty of time and patience. We will of already cleaned the frames back a little, and spliced the worst of what’s in view here. The decoration cost as we discussed would be £650.00 on this installation. If we reduced this cost, and add the materials to the figure, it would reduce £600.00 from the £3300.00 figure. This makes the total install cost double glazed, without decoration to be £2700.00 which does bring this installation into the viable territory again. 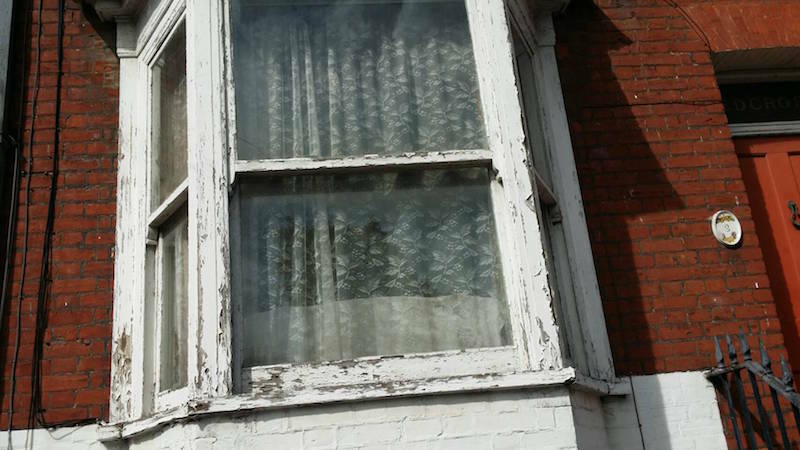 Repair sash windows: a look at the bay side on. As you can see there’s some real thinking to do here and not a decision to be rushed. If you had ten windows, for me this would be a no brainer, I would repair all of these windows and install double glazing to the original sash windows, then decorate myself. (Assuming I wanted double glazing, if not I’d draught proof). The saving over ten windows, even if I double glazed, would be at least £6000.00 and then it’s almost certain your windows will not be in the condition of the bay above. The saving is more likely to be £7000-8000 – this is a lot of money. What I would do is not right or wrong. There are plenty in the camp that would think, I am spending this much money £9,000 and £15,000 are not all that far apart, I might as well do the complete replacement job and have piece of mind. While I respectfully disagree with this, there certainly is some truth to the statement. A new double glazed sash window comes with a ten year, insurance backed guarantee, whereas double glazing of the original sash windows only carries a five year guarantee. So one might consider the warranty in the cost as well, however unlikely a double glazed unit is to fail, it’s a cost to consider nevertheless. The final option would be to manufacture new double glazed sash windows and re-use the existing frame. If you did not decorate, the cost would be £3900.00. I won’t go into significant detail on this one because it’s of no value at all. The double glazed units will be 8mm cavity and this is inferior to the double glazing units of complete replacement which is 16mm. Then there is the guarantee to consider, five years for use of the original window, and ten for complete replacement. Aside from this, the new windows will obviously look amazing. I hope at this point your less confused than when we started and more keen to repair sash windows!? With all the numbers and potential combinations there’s plenty to think about, and each one has it’s merits, as well as it’s faults. The important part is finding what you perceive to be good value for your situation, there is no right or wrong answer and only the best option for you. With that said I’d like to look at another scenario in case this wasn’t relevant to you. This is the most common scenario we come by.The sash window is letting a great deal of heat escape. The window pictured is not in excellent structural condition but it’s not bad, it just needs a bit of work on the front cheek, as you can see in the bottom left hand corner, and then the rail needs a little work, and the putty needs attention. This looks a great deal worse than it is. It’s also a great opportunity to discuss the difference in pricing between the best value for money service – overhaul and draught proofing with repair, with the most costly, new joinery – with a difference on this scenario, the joinery is far more intricate and requires considerably more work, and is some of the most expensive style you can find in sash windows. It’s not surprising then that repair, and use of existing joinery is going to offer excellent value for money, to the point replacement won’t be an economically viable enough option for most people, however we will go through the possibilities as there is no right or wrong option and is completely down to what’s right for the individual and their situation. The cost of draught proofing this window would be £200 and the front cheek and rail repair £120 so a total of £320.00. The cost of entire replacement would be £1800.00. The option of manufacturing new sash windows double glazed, making good use of the original frame would cost £900.00 including a draught proofing system. In the situation where draughts are your biggest concern, the correct approach would be draught proofing. There’s a way of being sure of this. Simply masking tape all the gaps on your original sash window, and then put a candle lit close by to see if you’ve closed up the gaps well enough. Then once this is done, feel free to turn on your heating and test the difference. If this is improved enough then excellent, a high quality draught proofing system that’s inexpensive is the perfect solution. If you don’t feel comfortable with the draught proofing improvement, there’s two further options before complete replacement. As we previously mentioned, manufacturing double glazing sash windows will almost certainly make the difference your looking for if sealing the gaps on your windows didn’t quite do it for you, but before you go for the double glazing option, what about heavy lined curtains? They will make a lovely addition to your home, which although costly, will make a big difference to your comfort. Just take a look at this picture of the curtain to understand quite how nice your home could be with lovely curtains. Image by Hayburn & Co. Heavy curtains to reduce heat loss on a sash window. It will vastly improve the warmth of your home as well as improve privacy. The warmth will be upgraded to a similar level of double glazing as well. You also keep nice, ornate, slender sash windows. I am not trying to stop you spending a great deal of money double glazing sash windows, but this article was in place to offer as much impartial advice as possible. 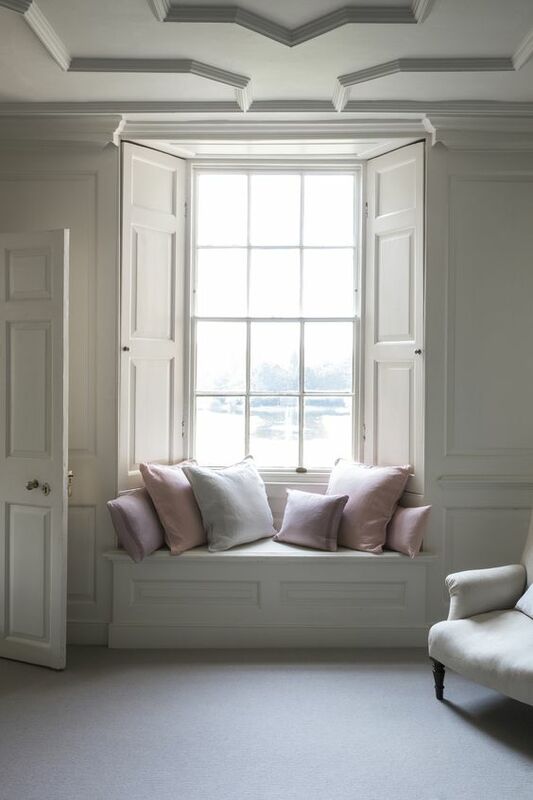 In this situation curtains are going to make your home warmer, and they’ll look grand as well, and let’s be honest, the sash window pictured looks pretty good without us making any joinery changes! If you prefer plantation shutters, then they will help with heat insulation, but not to a point that you’ll feel more comfortable. 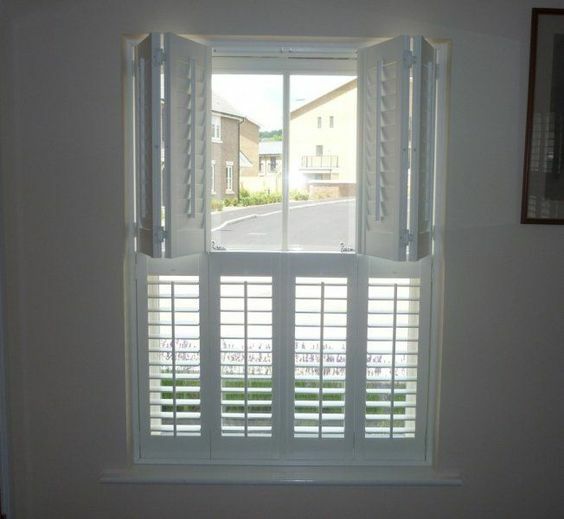 Most clients will install double glazed sash windows with their plantation shutters. Please take a look at this image, they certainly look the part! Image by Stylish Shutters. Shutter to improve insulation by covering the sash window. Plantation shutters really look the part but they have too many gaps to be efficient in insulating your property as well as heavy curtains. The sash window in question looks dazzling but if noise is a problem there’s not a lot a draught proofing system will do to significantly improve things. It will take the edge off the background but won’t fully give you peace and quiet. I’ve gone into this at great length in the sound proof sash windows post, where we look closely at the dB improvements of various options. The best option being secondary glazing, but I hardly think you’d ruin this stunning room with that technique here. There are three real options here. Entire replacement which will cost £1700 and up on this nice window. Glazing bar will be laminated to keep slender glazing bar sections and if entirely replacing a 16mm air cavity will certainly work really well, it might give the sash a slightly chunky look though. The next option would be to manufacture sashes and use the existing frame. You would only achieve an 8mm air spacer but the sash would look a little more authentic and would only cost £850.00 and need a little touching up paint wise. Since the decoration is in great order here already. The minor scuffing to the frame is an easy touch up job. The sash might also be slightly different in colour to the frames, but again this is a quick coat of paint, certainly not worth paying £250 to have done by someone else! The third option is to install slim line units into the original sash itself. This is the most sympathetic method to improve this window but the air gap is just 4mm and so the least effective sound proofing and noise pollution insulator. It will also certainly mean decoration again as a result of removal of the original glazing. While it’ll look exactly the same as a single glazed window. Performance wise it’ll not be as good as replacing the sashes and making use of the existing frame, an also cost more at £1100.00. It’s worth taking a look at our sash windows prices page as well. This will help pick between all these options. So it depends how far you’d like to take the authentic look and feel. Personally, knowing that replacement sashes will look really nice, I’d go for that option, but true conservationists, might see better value in using the slim line unit.